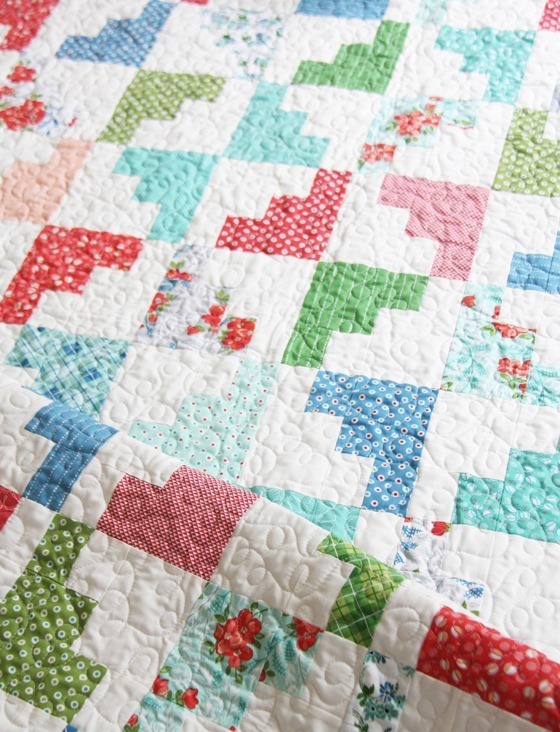 This quilt just looks like the month of March…all springy and March-y (?). Anyways…this one is my favorite out of the new bunch of quilts. I’ve made this 3 times already from layer cakes, and it’s easy to make and quick to layout…just the way I like ‘em. Anyone with small children knows you can’t have quilt blocks laid out on the floor for more than an hour or it begs to be destroyed and scattered. 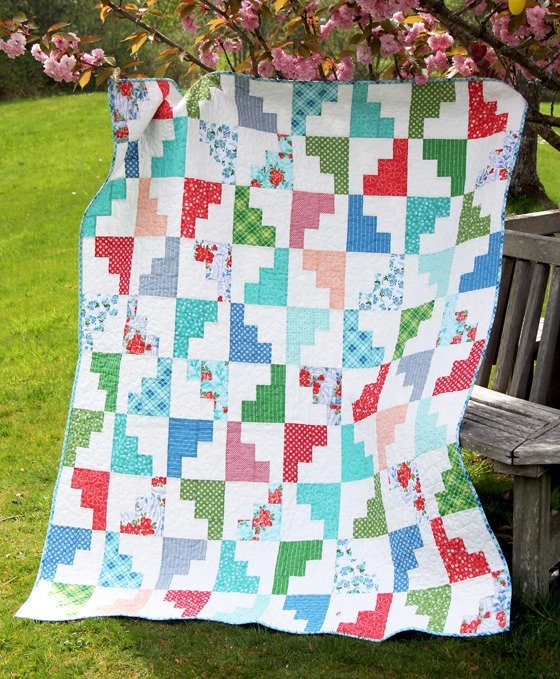 This version was made with a layer cake (a pack of 42 – 10” squares) of Hazel, and quilted by Kathy in lovely loops. I have to hand it to my three awesome kids. By now they know that “let’s go to the park” is Mom code for “let’s go take a thousand pictures of quilts at the park”. They don’t even blink when I pack 5 quilts and my camera onto the stroller. 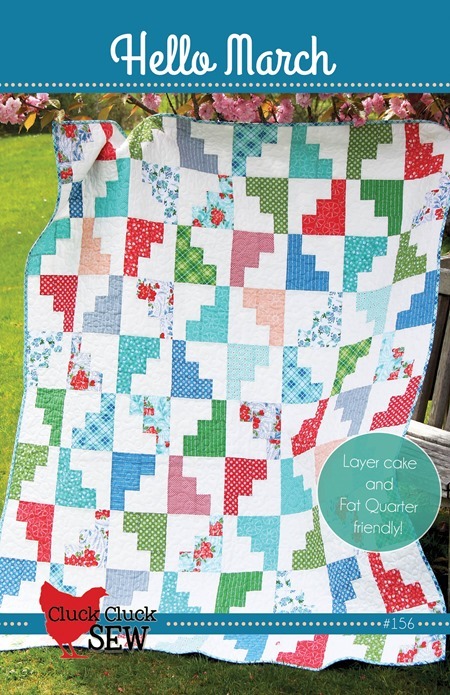 This pattern comes in 5 sizes and is layer cake or fat quarter friendly. I made a bright summery version of this I’ll show you soon…it’s very bright but perfect for kids. I like this pattern very much. It could look interesting in Civil War prints too I think. 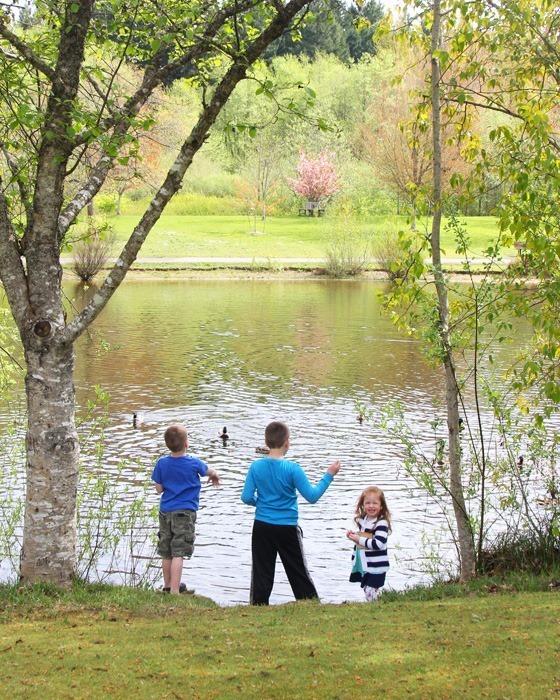 Funny thinking of you taking your quilts (and children) to the park! My youngest is 17 years old but I still use his buggy for delivering leaflets in my neighbourhood! How funny! I agree it would look great in Civil War Prints! This is my favorite of your new patterns. I have many layer cakes so it will be perfect. I like easy even if my kids are grown. I can get on to the next quilt. Thank you Allison! I love this one! it reminds me of a puzzle! Love this one too but Promenade is still my favorite! This pattern 'Hello March' is one of my favorite of your new pattern collection. Our oldest was born in March – so that might be part of the reason :)! But I love the Log Cabin type resemblance of this and how it shows off your lovely new Fabric. great quilt! 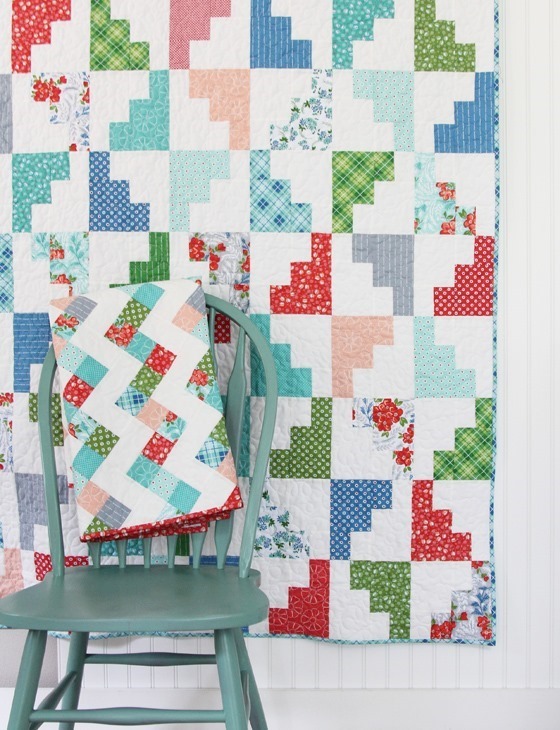 I love a quilt that lends itself to so many different colorways. These colors, however, are perfect after the long winter we had here in New England! The pattern would make a lovely baby quilt. I will have to to make one. I love this quilt…and had to laugh about quilt blocks laid out & kids…the same happens here but with cats! They have tons of places they could be…but choose to be on my quilts in progress. I am always amazed at how prolific your quilt pattern creativity is! Thank you and may you continue to be the endlessly creative person that you are. I also have to mention that your pattern directions are easy to follow and I love that too! Very nice. It does remind me of spring. I haven't gotten "into" the layer cakes yet – I'm a charm square fanatic!! But I've been thinking of trying something with them. I think this pattern would be a good start. I love this pattern! Very nice. You are SO good! I love it – especially since I can now start cutting into my layer cakes that I've just been petting….thanks! 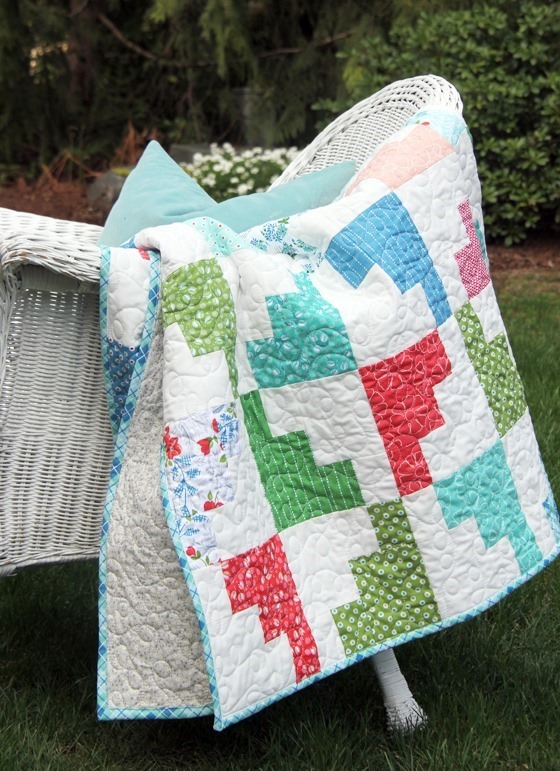 I'm always searching for quilt patterns that use layer cakes…this one is so great! Can't wait to see your "summery" version! And anyone with dogs – which I have "instead"? of children – knows you can't have blocks laid out on the floor at all! So I have to use a design wall, lay out my quilts on the bed, or do it while away on retreat! I've already bought this pattern and can't wait to try it out, with layer cakes or other fabric! I think this is one of my favorite patterns of yours! It's simple, yet beautiful. This quilt makes me smile . . . the pdf which I just ordered this morning, is in my to do basket!! I am really late to this party. Just bought the pdf for this pattern and was wondering if layer cakes could also be used for the background. I have the perfect combo of layer cakes in mind for this.